Iowa Barnstormers Head Coach and Director of Football Operations Mike Hohensee continued his assault on local talent today, announcing that the team has been assigned Offensive Tackle Dace Richardson and Wide Receiver Darius Reynolds. Both players will return for their second seasons with the Barnstormers, with each agreeing to a one-year contract. Richardson (6-6, 310) joined the Barnstormers for the final 3 games of the 2012 season, starting all 3 games at Offensive Tackle. Richardson is a native of Wheaton, IL and spent five seasons playing for the University of Iowa Hawkeyes (2005-09). He was named to the all Big 10 team following his sophomore year in 2006. Richardson missed much of the next two seasons due to injury, but returned strong for his senior year in 2009, where he was named Iowa’s comeback player of the year and once again voted to the Big 10 first team. 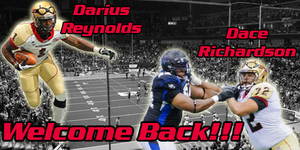 Reynolds (6-2, 215) was assigned to the Barnstormers on July 3, 2012 and appeared in 2 games. In those games, he recorded 3 receptions for 63 yards and his first career AFL touchdown. Prior to that Reynolds attended the 2012 Green Bay Packers rookie camp following a career at Iowa State University. Reynolds started for two seasons with the Cyclones, developing into a top prospect. In 2011 as a senior, he led Iowa State with 43 receptions for 695 yards and 7 touchdowns. The Woodbridge, VA native was invited to the Players All-Star Classic following his senior season, where he led the South team with 4 catches for 72 yards. Reynolds is reunited with former Cyclone DB Ter’Ran Benton, who was assigned to the Barnstormers on October 21.